Viking has cancelled the next sailing of Viking Sky from Tilbury on Wednesday after a disastrous ending to its first winter season sailing in Norway. 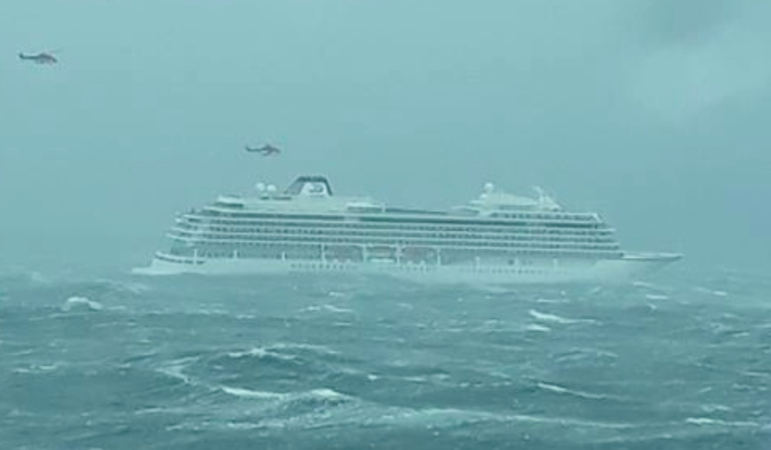 Almost half the passengers on the £4,000 cruise had to be airlifted to safety during a dramatic helicopter rescue on Saturday after the ship lost power and was battered by rough seas, forcing it to issue a Mayday call. It is understood that some 20 people had to be treated in hospital for injuries after being winched off the ship by helicopter. Viking Sky managed to dock in Molde on the coast of Norway yesterday with the remaining passengers onboard. It is understood the cruise line began flying home passengers last night, but the ship will have to remain in the port for repairs to be carried out. The 915 passengers and 458 crew were on a two-week 'In Search of the Northern Lights' cruise, which started - and was due to end - in Tilbury in Essex. However, 479 had to be airlifted from the ship after a wave smashed through a window of the ship, knocking passengers - many of them elderly - off their feet and causing injuries. The cruise line said: "Currently we understand 20 people suffered injuries as a result of this incident, and they are all receiving care at the relevant medical centres in Norway, with some already having been discharged. "Throughout all of this, our first priority was for the safety and wellbeing of our passengers and our crew. "We would like to thank the Norwegian Redningssentral and the Norwegian emergency services for their support and skill displayed in managing the situation in very challenging weather conditions. "We would also like to thank the local residents who throughout the whole process have been extremely supportive and hospitable." In a statement posted on its website, Viking said: "The next sailing, Scandinavia & the Kiel Canal, which was scheduled to embark on March 27th has been cancelled, and guests and their travel agents have been contacted directly. We do not anticipate any additional cancellations at this time."